Made by Transavia Corporation Pty Ltd in Seven Hills, New South Wales, 1965. This aircraft is a single engine type with an unusual wing configuration, twin tail booms and high cabin. The primary structural elements comprise the hopper, the main undercarriage cross-beam and engine mount. The upper mainplanes are bolted to lugs on the hopper shoulders, and flight loads were transmitted through V-struts to the undercarriage crossbeam which is faired to form the short lower wing. By having the hopper integrated into the main structure enabled the aircraft to withstand greater impact forces in case of an accident. The aircraft has two separate tail units attached by their supporting booms to the centreline of each wing. Horizontal and vertical tail surfaces remained clean of the slip-stream. The wide gap of 3.5 metres (11 foot 6 inches) between the tail units enabled a loading truck to move in and out from the aircraft on full lock. The hopper is made of aircraft quality steel and aluminium alloy. The rest of the structure is primarily aircraft quality steel. The wings, booms and tail units are aluminium alloy. Cowls and fairings are moulded resin-bonded fibreglass. The hopper is coated inside with epoxy resin to protect it from corrosive chemicals and to seal it for carrying liquids. Passenger capacity: one person in rear cabin with hopper load or 2 passengers with no hopper load. Designed by Luigi Pellarini, the PL-12 Airtruk was conceived as a rugged utility aircraft with the primary function of agricultural spraying and crop dusting. Airtruks were mass produced by Transavia Corporation Pty Ltd, a subsidiary of construction company Transfield Pty Ltd at its plant at in the Sydney suburb of Seven Hills, New South Wales. The design progenitors of the Airtruk were the Kingsford Smith Aviation Services Pty Ltd PL-7 Tanker, first flown on 21 September 1956, and the Bennett PL-11 Airtrucks, two of which were built at Waitomo in New Zealand based on the Tanker and using war surplus North American Harvard parts. The PL-7 and PL-11 aircraft were also designed by Luigi Pellarini. In the early 1960s Luigi Pellarini approached Transfield Pty Ltd to assist him to bring to production the PL-12 aircraft he had designed. Despite the fact that Transfield was a steel fabrication and construction company, one of its Directors, Mr Franco Belgiorno-Nettis, was interested in aviation, having wanted to join the Italian Air Force as a young man but considered too short to fulfil the recruiting requirements. In 1964 Transfield had moved into aviation with the importation of a Siai-Marchetti FN-333 Riviera amphibious aircraft, for which it hoped to become the Australian distributor. However, no sales of the Riviera were made. It is unclear if Transavia was formed as a response to Pellarini's approach (with the Riviera sales seen as a side activity) or if the Riviera sales were to be the mainstay of Transavia activities, with the Pellarini proposal accepted because of the lack of Riviera orders. 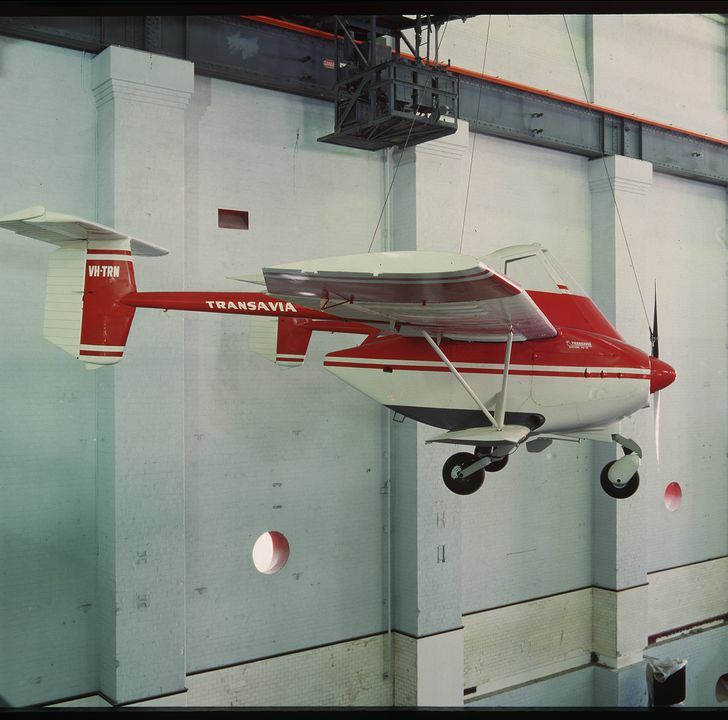 After the first prototype Airtuk had been destroyed in structural strength and safety testing, the second prototype, VH-TRN, was flown for the first time on 15 April 1965 from Bankstown Airport. The test pilot was New Zealander Neil Johnston, who had flown the PL-11 Airtrucks in New Zealand. Production began in 1966, and the prototype remained in use until withdrawn on 3 March 1969. According to a letter from Bill Bannister, Acting Manager of the Technology Restoration Society (a voluntary organisation which assisted the Museum with the acquisition and/or restoration of certain objects in the 1980s) to the then Museum Director, Dr. Lindsay Sharp, VH-TRN was repurchased by Transavia after the aircraft had completed its allotted airframe hours and was rebuilt for the Museum. It was in the company's ownership on 20 January 1984 when it was noted as offered to the Museum in fully restored condition. Nothing is currently known about VH-TRN between its withdrawal from service date of 3 March 1969, its 'repurchase' by Transavia and its offer to the Museum on January 20, 1984.